Smith, M.F. and J.L. Patton. 1999. 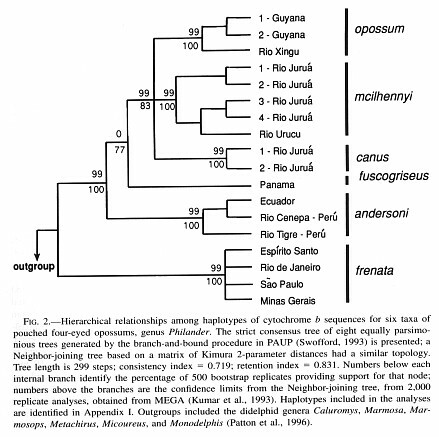 Phylogenetic relationships and the radiation of sigmodontine rodents in South America: evidence from cytochrome b. J. Mamm. Evol. 6:89-128. Patton, J.L. and M.N.F. da Silva 1998. Rivers, refuges, and ridges: the geography of speciation of Amazonian mammals. In: D.J. Haward & S.T. Berlocher (eds. ), Endless forms: species and speceiation, pp. 202-213. Oxford University Press, New York. Smith, M.F. and J.L. Patton. 1993. The diversification of South American murid rodents: evidence from mitochondrial DNA sequence data for the akodontine tribe. Biological Journal of the Linnean Society 50:149-177 (Abstract). 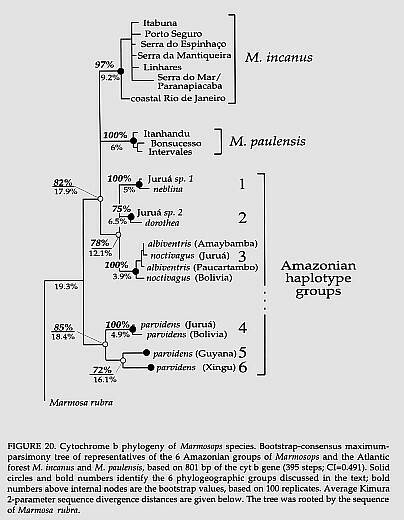 The phylogeographic structure of 15 genera of Amazonian marsupials and rodents is summarized based on comparative sequence of the mitochondrial cytochrome b gene. The data are limited in geographical coverage, with samples widely scattered throughout Amazonia from the base of the Andes in Peru to the Guianan coast and eastern Brazil. We use this approach to define species boundaries, based minimally on the principle of reciprocal monophyly, in conjunction with morphological or other genetic discontinuities. The taxa so defined are older than previously appreciated, with many lineages dating from 1 to more than 3 Myr, and thus apparently predating the early Pleistocene. We relate patterns of concordant geographical shifts with underlying tectonic history and to current positions of major rivers. Finally, we provide comments on the utility of these data and patterns to conservation, articulating a need to incorporate phylogeographic information as part of the rationale in establishing conservation priorities at the organismal and geographical area levels. Proc. Biol. Soc. Wash. 111:436-471. 1998. A total of eight species of spiny rats of the genus Proechimys are included within a collection of mammals assembled during a year-long survey of vertebrates along the Rio Juruá in the western Amazon Basin of Brazil. Four of these are the well-recognized taxa in western Amazonia, P. simonsi, P. brevicauda, P. cuvieri, and P. steerei, but the remaining four are new (P. echinothrix, P. kulinae, P. pattoni, and P. gardneri). The diagnoses and descriptions of the new taxa are provided herein on the basis of genetic (chromosomes and DNA sequences) and morphological data. The latter include bacular characters, qualitative and quantitative features of the cranium and external morphology. Mitochondrial DNA (mtDNA) variation in the cytochrome b gene was determined for two divergent taxa of pocket gophers, Thomomysbottaeactuosus and T. b. ruidosae. These two taxa hybridize in a narrow contact zone, but introgression of nuclear markers such as allozymes or chromosomes does not extend much beyond the hybrid zone (Patton et al. 1979). We found that despite their distinctness, the two subspecies shared very similar mtDNA haplotypes. By a comparison of phylogenetic histories derived from nuclear markers (allozymes) and from mtDNA haplotypes sampled in different populations of T. bottae from New Mexico, we show that apparent similarity is due to an introgression of T. b. ruidosae mtDNA into T. b. actuosus nuclear background. Evidence of introgression is not limited to the present-day contact zone between these two taxa, but extends at least 75 km away from it. The actuosus haplotype coexists along with the ruidosae mtDNA in the Gallinas Mts., which are inhabited by otherwise pure T. b. actuosus, while further north only typical actuosus haplotypes were detected. Of several potential mechanisms which could lead to such a geographical pattern of variation, we argue that a combination of range shifts due to climatic fluctuations, and genetic drift are most likely. Horizontal gene transfers due to hybridization are historical events which seem rather common among pocket gophers. Although they can be identified with careful phylogenetic study using independent data sets, the potential for misinterpreting a gene tree as an organismal tree is great in this and other groups of animals. 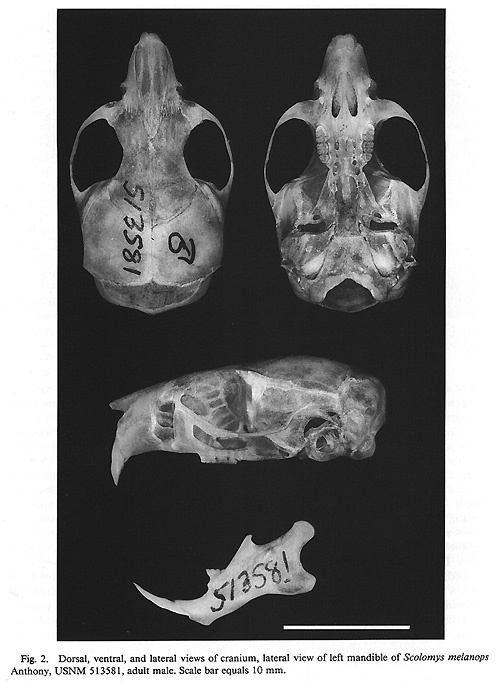 University of California Publications in Zoology 130:i-x, 1-86. 1997. Two species of slender mouse opossums, genus Marmosops, co-occur in the Atlantic forest of coastal Brazil, rather than the single species (M. incanus) currently recognized. The two species - M. incanus (Lund, 1840) and M. paulensis (Tate, 1931) - are highly divergent from each other in the sequence of the mitochondrial cytochrome b gene (about 17% corrected divergence) and, although generally similar morphologically, display several diagnostic cranial and external characters. They are sympatric at several localities in the southeastern region of Brazil. Marmosops incanus is widely distributed, primarily in the northern part of the coast, living in the wet low-elevation forests up to 800 m elevation in the coastal escarpment and also in the drier semi-deciduous forests inland of the coastal mountains on the Brazilian plateau. M. paulensis has a more restricted distribution along the southern coast, living in montane forests above 800 m. As M. paulensis extends northward atop the coastal mountain ranges, the two species occur in sympatry at the approximate boundary between the low-elevation and montane forests. This distribution pattern is repeated by at least two other Atlantic forest taxa, species of the formicarud bird genus Drymophila and of the murid rodent genus Delomys, suggesting a general biogeographic pattern in this region to be found in yet other poorly studied groups of organisms. Both M. incanus and M. paulensis also display substantial intra-specific levels of sequence divergence (up to 13%), and their respective populations are strongly partitioned into geographically defined phylogenetic units which are generally concordant with major topographic features in the Atlantic forest. Comparison of the cytochrome b haplotypes of the two Atlantic forest species with those from Amazonian Marmosops species revealed that the divergence between M. incanus and M. paulensis is among the oldest in the genus, potentially dating from the Miocene, a period when tectonic activity was intense in the Atlantic forest region. The two species are so divergent that their sister-group relationship, the simplest biogeographic expectation, cannot be confirmed from the sequence data. While the major clades within Marmosops seem to have originated in the Miocene, the extensive geographic variation within the Atlantic forest species, as well as within the Amazonian taxa probably dates from the early Pleistocene and may be the result of successive climatic variation during that period. 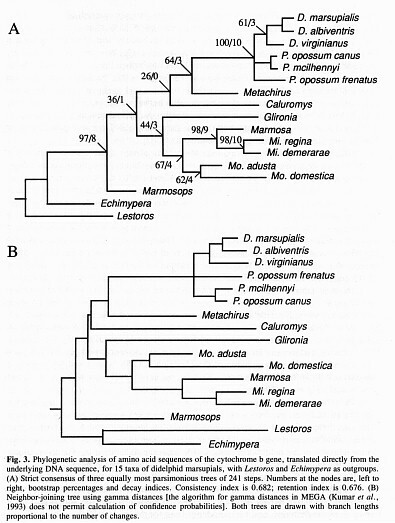 Cytochrome b phylogeny of Marmosps. 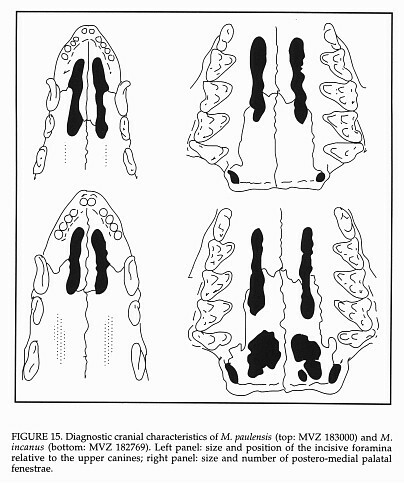 Diagnostic cranial characteristics of M. paulensis and M. incanus. Journal of Mammalogy 78(1):90-102. 1997. We hypothesize phyletic relationships among taxa of the didelphid marsupial genus Philander, based on sequences of the mitochondrial cytochrome b gene. Data are available for six taxa recognized at either the specific or subspecific levels; P. opossum opossum Linneaus (eastern and northeastern Amazonia), P. opossum canus Osgood (western Amazonia), P. opossum fuscogriseus J. 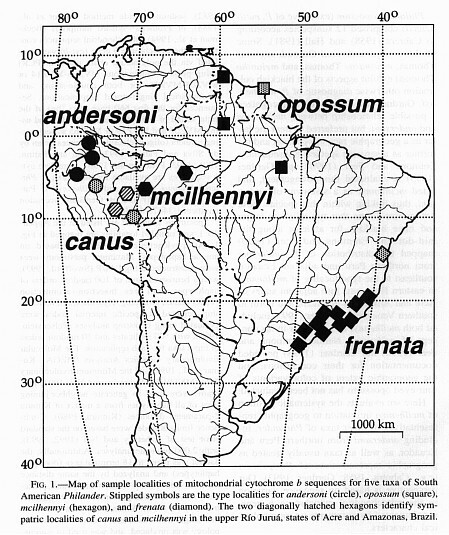 A. Allen (southeastern Central America), P. opossum frenata Olfers (southeastern Brazil), P. andersoni andersoni Osgood (northwestern Amazonia), and P. andersoni mcilhennyi Gardner and Patton (west-central Amazonia). Haplotype diver-gence is minimal to non-existent (<1% on average) between individuals within and among localities for each taxon. The taxon inhabiting the Atlantic forest of coastal Brazil (P. o. frenata) is highly divergent from all others, averaging nearly 14% in sequence divergence. Maximal divergence among haplotypes representative of the other taxa examined is <8%. The combination of phylogenetic relationships and local sympatry suggests a greater degree of species diversity for the genus than the two species P. opossum and P. andersoni. We recognize the Brazilian coastal P. frenata, as well as both P. andersoni and P. mcilhennyi, as valid species in addition to P. opossum. It is possible P. opossum is a composite, and that further studies will accord species status to the Middle American, western Amazonian, and eastern Amazonian-Guianan gray four-eyed opossums. We describe patterns of genotypic and phenotypic variation in saddle-back tama-rin (Saguinus fuscicollis) populations along the central and upper Rio Juruá, western Brazilian Amazonia. The genetic data are sequence haplotypes of the mitochondrial cytochrome b gene; phenotypic data are pelage colour variants that define sharply demarcated subspecies of this extremely variable tamarin species. We show that gene flow occurs between adjacent subspecies, but that this phenomenon is restricted to the headwater section of the river, which is consistent with expectations from the riverine barrier hypothesis. In this model, the major first-order tributaries of the Amazon form effective barriers to dispersal, with between-bank gene flow limited to the narrowed sections of headwater streams and parallel divergence increasing along both banks from the headwaters to the mouth of a given river. In meandering rivers such as the Rio Juruá, we suggest passive transfer through river channel dynamics as the main mechanism permitting genetic contact between populations on opposite banks of the river. Finally, we argue that in the case of plant and animal species that are largely restricted to unflooded (terra firme) forests, such as tamarins, seasonally flooded (várzea) forest can operate as a critical additional barrier to between-bank gene flow. Journal of Mammalian Evolution 3(1):3-29. 1996. Variation in the mitochondrial cytochrome b gene (nucleotide and amino acid sequences) is evaluated for 9 genera and 15 species of American opossums in the family Didelphidae, using the American caenolestid rat opossum Lestoros and the New Guinean peroryctid bandicoot Echimypera as outgroups. Phylogenetic analyses (parsimony and distance) strongly support the monophyly of the Didelphidae and delineate two major clades; (1) Didelphis and Philander are strongly aligned sister taxa, with Metachirus weakly but consistently associated with them, and (2) Marmosa plus Micoureus, with Monodelphis falling outside that pair. The genera Marmosops, Caluromys, and Glironia exhibit varied relationships, depending upon the method of analysis and data (DNA or amino acid sequences) used, but generally are placed individually or in combinations near or at the base of the didelphid radiation. Some aspects of these relationships are consistent with current taxonomic views, but others are in marked contrast. Specifically, a dade comprised of the mouse opossums Marmosa, Micoureus, and Marmosops is strongly rejected by log-likelihood analysis, contrary to expectations from some current clas-sifications. Also, the woolly opossums Calaromys and Glironia also do not form a sister-taxon relationship, as suggested by their placement in a subfamily separate from the remaining didelphids examined. However, such a relationship cannot be rejected from log-likelihood analyses. The relationships suggested from cyt-b sequences are strongly concordant with those based on DNA-DNA hybridization analyses. In addition to systematic and phylogenetic properties, molecular evolution of the didelphid cytochrome b gene sequence is characterized according to nucleotide bias and rate differentials at each codon position and across the entire sequence. 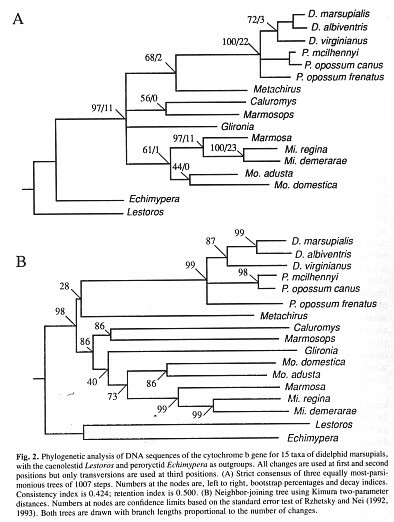 Marsupials; Didelphidae; mtDNA sequences; cytochrome b; phylogeny; evolutionary rate. Phylogenetic trees: DNA sequences of the cytochrome b gene. Phylogenetic trees: amino acid sequences of the cytochrome b gene. Proceedings of the Biological Society of Washington 108(2):319-337. 1995. Included within a collection of mammals assembled during a year-long vertebrate survey of the Rio Juruá in the western Amazon Basin of Brazil is a series of specimens of a new spiny mouse of the genus Scolomys. This genus is one of the more highly-localized and poorly-known murid rodents of the neotropical forests. Prior to the collection reported here, there were two recognized species known from a total of 15 specimens. One of these, S. melanops Anthony, 1924, is known only from three closely spaced localities in eastern Ecuador; the second, S. ucayalensis Pacheco, 1991, is known from only one locality in north-central Peru. We provide a revised diagnosis and description of the genus while describing the third species, suggest phylogenetic affinities of the genus within the tribe Oryzomyini, and summarize aspects of the ecology and life history of the new species. Sequence variation in the mitochondrial cytochrome b gene was examined in the arboreal spiny rat, Mesomys hispidus, collected at 15 sites along the Rio Juruá in western Amazonia, Brazil, to determine the importance of riverine barriers in the diversification of this taxon. Twenty individual haplotypes were uncovered, most of which were unique to single localities but some of which were shared among adjacent sites either along or across the river. Genealogical analyses suggest that gene flow is limited and, in combination with the unique distribution of most haplotypes, suggest that populations of this species are strongly substrnctured along the river. Thus, most sharing of haplotypes between adjacent localities is probably caused by historical association rather than to ongoing gene flow. Two haplotype clades were uncovered, but these correspond to headwaters versus mouth areas, not to opposite sides of the river, as would be expected by the Riverine Barrier Hypothesis. Moreover, haplotype sharing across the river was greater at its mouth than in the headwaters, a pattern opposite that expected if the river were a substantive barrier. Broader scale phylogeographic patterns of this species show that both clades have relationships to areas well outside the Rio Juruá basin. This suggests that the basin represents a relatively recent point of invasion between two more broadly distributed and differentiated geographic units of the species. 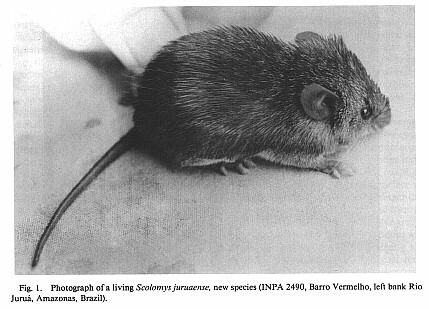 Amazon Basin, arboreal spiny rat, cytochrome b, Mesomys, mitochondrial DNA haplotype, phylogeography, river barriers. Biological Journal of the Linnean Society 50:149-177. 1993. University of California, Berkeley, Caifornia 94720, U.S.A.
Phylogenetic relationships based on 801 base pairs (bp) of the mitochondrial cytochrome b gene are examined for eight genera and 28 species of the akodontine tribe of South American murid rodents. The akodontine tribe comprises some 35% of the total diversity of the subfamily Sigmodontinae, but the current taxonomy at virtually all levels is uncertain because ofinadequate generic diagnoses and assessments of variation and trends in traditional morphological characters. Monophyly of the tribe cannot be resolved by the sequence data, based on comparisons to outgroup taxa in three other tribes (Oryzomyini, Phyllotini, and Thomasomyini). However, highly corroborated monophyletic units within the group are obtained in a variety of both parsimony and distance analyses. These include a redefined and numerically dominant genus Akodon (with Microxus and Hypsimys as synonyms), Bolomys, Lenoxus, Oxymycterus, and a strongly supported assemblage that includes the central Andean Chroeomys and Akodon andinus and the southern Abrothrix, 'Akodon' olivaceus, and the long-clawed mice of the genera Notiomys, Geoxus, and Chelemys. Sequence divergence within species is typically less than 5%, although levels can reach 10% for some highly polytypic forms. Divergence among genera within the tribe reaches 35% in corrected estimates, a level that is as great as that among representatives of different tribes. Changes in the current classification of akodontines are suggested based on these data, and the timing and place of origin of the tribe and its radiation is discussed. MtDNA - sequence divergence - Akodon - South America - phylogenetics.